Katti Renik was a dance major at the University of Wyoming when she decided to give up her pointe shoes for a pair of fishing waders. helping her dad raise trout and then a summer at an Alaskan salmon hatchery where she met Evan, her husband and kindred angler. Last year, the couple moved to Minnesota — he for a forestry job, she to pursue a graduate degree in aquatic biology at Bemidji State University. She will graduate in 2019 and plans to continue her work improving fisheries habitat. Renik and Dr. Andy Hafs, associate professor of biology, are conducting a two-year study along the North Shore of Lake Superior on the relationship between beavers and brook trout. Hafs works as the primary investigator, while Renik leads the field work. Renik’s work was featured on public television’s “Prairie Sportsman” program in March. 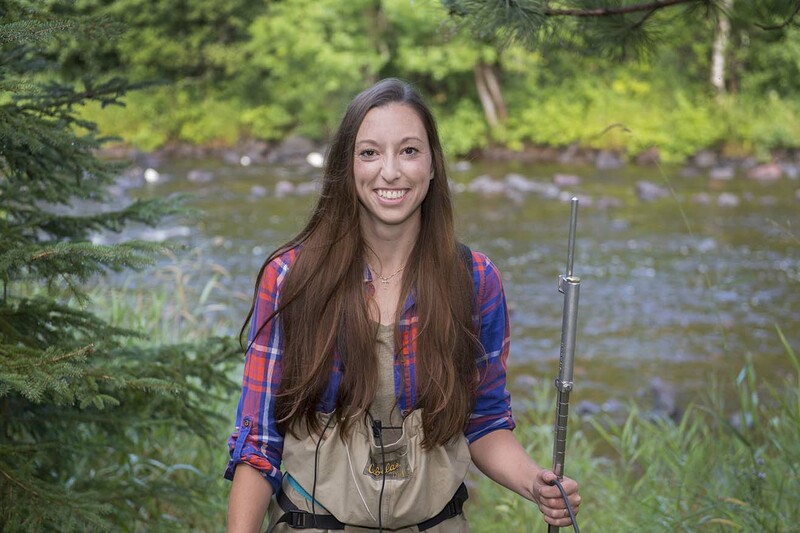 She also wrote an article for a women’s fly-fishing magazine, presented at a January wildlife conference in Milwaukee and co-authored a paper to be published in the North American Journal of Fisheries Management. At Bemidji State, Renik prefers warm boots over dance shoes. She learned to ice fish and cross-country ski and appreciates the beautiful campus and opportunities she has found there.